It's been awhile. I've been busy, what can I say? The transition from one kid to two has thoroughly rocked my world - personally, professionally, craftily...Is that a word? I don't know, I'm pretty sleep-deprived. So this post will, unfortunately, not be about a cool new project I'm working on, although I can say I'm finally feeling the creative juices flowing a little bit. My office/studio is now a nursery, with my desk in the living room and everything else in the garage. So much for my room with a view. But I'm working on it and looking to rent a small space when the babe heads to daycare a few days shortly after her first birthday. In the meantime, let me share with you a little bit of what we did on our summer vacation, with the kiddo home quite a bit during his transition from preschool to kindergarten. Yep, we ate donuts. I perused this great list of ideas of things to do from local mamas-owned 510 Families, prioritizing their suggestion for 8/23. I follow various Oakland folks and institutions on Facebook and Twitter so I remembered reading about Doughnut Dolly when they opened not too long ago. And there's nothing I enjoy more than schlepping kids to foodie joints with a particular hipster vibe so when 510 Families jogged my memory it was a no-brainer. They were good, but for the hype and price (3 bucks a pop!) I was a bit underwhelmed. Their hook is the filling, offering their "naughty cream" every day, plus a locally sourced fruit filling (tangerine is the flavor we tried) and two others (Mexican chocolate and coconut cream the day we went). All the donuts are the same - a sugary raised donut that gets filled to order - and it's good and fresh and all but not ah-mazing. The fillings are yummy but it is a donut shop, after all, not a creamy goo shop. The shop itself is super cute - there's a bit of a vintage vibe from the filling containers on the counter that greets you as you enter. And the guy that filled our donuts was very nice, explaining their philosophy, the flavors of the day, where they source their ingredients, etc. Definitely a donut shop to try but I can't imagine it'll ever be a regular stop for us. We carried over our donut obsession on our second of two summer road trips, most recently up to Oregon to visit some of my family. Our mission: to try the best donuts in Bend. We started with a traditional joint, Richard's Donuts & Pastries. They were excellent basic donuts with bonus points for the classic cake donut with pink frosting and sprinkles (honestly, why is there not a single donut shop in the East Bay that offers such a donut?? ), sadly hidden under the powdered sugar-dusted donut you see in the top left corner. We sampled quite a few, as you can see from the image above. With two other shops to try later that day I was initially not exactly blown away by Richard's, assuming the newer more contemporary offerings would be more my thing. I was wrong. At each of the following two stops we spent about the same amount of money ($10 or so...yes, we spent $30 on donuts in one day) for fewer donuts each time. Ten bucks got us half-a-dozen donuts at The Dough Nut. This place seemed like it'd hit my donut spot, reminding me of the South Bay's Psycho Donuts, offering traditional donuts with unique frosting flavors and toppings like root beer float, maple bacon, and pb&j. They were good (though not nearly as good as Psycho's) but I made the mistake of waiting until after dinner to try them and even just a few hours later they were already pretty stale. They were nearly inedible by the next morning, which isn't a terribly fair review but still - day-old donuts should be edible if not pretty good, no? Our final stop was the food truck Glazed and Amused Doughnuts, which parks about a block or two from the busy downtown area Tuesday through Saturday evenings from 6 pm until midnight, or until they sell out. I love that they're only open in the evening, which seems delightfully subversive for a donut "shop." And these donuts are definitely better reserved for dessert - fried to order with toppings like peanut butter sauce and marshmallow fluff. These I'd definitely try again but I'd eat mine while standing outside the food truck as even later that evening they were fairly dry. If I'm in the mood for donuts on my next trip to Bend, Oregon, I'll stick with Richard's. After all, my Grandma, who's lived in Bend for over 30 years, did tell me Richard's are the best and you know what? She was right. 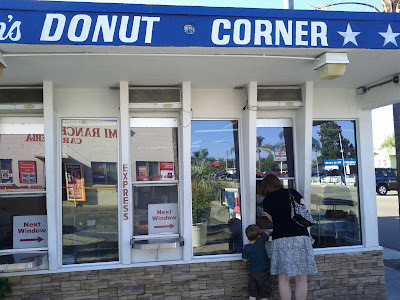 In the end, though, nothing yet compares to Peterson's Donut Corner in Escondido, a sometimes-more-than-once-per-visit staple when we visit family "down south" as we say up here in NorCal. I'm also looking forward to making the trek to San Diego to check out The Donut Bar. Any other donut shops I should try on my travels around the country?